If you are already in business or are thinking of starting a business and need money, this book will lead you through the ins and outs of raising equity capital from traditional venture capitalists or from informal investors, commonly referred to as "angels". First, it will take you on a tour of the venture capital business so that you get to know who the players are and how much money is available. You’ll learn what they are looking for; their preferences and where to find them. This includes directories as well as over a hundred venture capital conferences throughout North America and overseas. Second, it will provide you with the profiles of typical angels and the kind of investments they make. Sometimes angels cluster together in groups and combine their skills in helping start-ups and early stage companies to grow. You’ll also learn about corporate angels, i.e., companies which may be willing to invest if they can see a good fit with their current operations. Angels are a little more difficult to locate than traditional venture capitalists, but this book will provide you with some hints on where to find an angel investor. Whether you are dealing with an angel or a traditional venture capitalist, you will need to negotiate a deal. This is of paramount importance and an entire chapter is devoted to hints on negotiating. It takes the gloves off and puts you in the middle of the fight between protecting your interests versus those of the investor. You’ll find out what’s in store with the points that are likely to come up in negotiations and the due diligence process. You’ll learn about management fees, the delicate subject of control, restrictive and affirmative covenants. Then, there’s all the paperwork: the Term Sheet, the Share Purchase Agreement, the Investor Rights Agreement, the Right of First Refusal and Co-Sale Agreement, the No Shop Agreement and finally the Legal Agreement. Find out what’s involved in negotiating all these agreements. Finally, this book will help you to evaluate your chances of successfully obtaining formal venture capital or investment from an angel or cluster of angels. It takes a realistic approach and will hopefully save you a lot of time and effort in locating equity capital to start or grow your business. Chapter 3: How Much Money is Involved? Chapter 8: Informal Investors or "Angels"
Chapter 13: What are Your Chances? 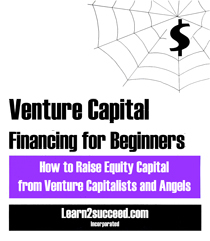 Venture Capital Financing for Beginners: How to Raise Equity Capital from Venture Capitalists and Angels by: Learn2succeed.com Incorporated: Softcover; 110 pages; ISBN: 978-1-55270-458-5 published in 2012; $19.99.